Four short letters for something so crippling. Facing death isn’t the scary part. I’ve always thought of it as going to sleep. It’s the happening; the potential events leading to it that terrify me. I’d prefer fast and painless—faster than asphyxia or drowning. Once, I choked on a meatball when I was at home all by myself. A complete airway obstruction. I couldn’t breathe and nothing else mattered when that next breath couldn’t come. I inhale, remembering how I knocked myself against the counter top. I don’t much care for being beaten to death, either, and I’m in no condition to put up much of a fight without risking him. And I will not risk him. As I pray, I am crushed by guilt for my trespasses, which flash before me. My erroneous behavior that resulted in the video, my poor judgment, petty thoughts and jealousies, fights with Lily and Noah. Neglecting Evan—a truth withheld is no different than a lie. Oh, God, I need help. I will die someday and when that time comes I’ll be ready, but not tonight, Lord. Please. Not like this. Protect me. Open my eyes to see a way out. Help me think through the confusion. Tell me what to do. I think over the desperate prayer and realize I’ve neglected the most important part. This is what I want, but You know better. So, let Your wil be done. I withhold the Amen, knowing I’m nowhere near finished. When I blink, my lashes no longer press against anything. The blindfold seems to have slipped down over my nose, not all the way, but enough to see. It’s still dark, but there’s a shape to the darkness. A hysterical cry wants to escape, but something tells me I should avoid making unnecessary noise. I can tell through the trace amounts of dim light that filter through the edges I am inside a trunk, but not the kind I thought. It has sharp corners and a lid like a rectangular storage box. Where it has—I have—been stashed, I have no idea, but I know I’m travelling. I feel the twists and turns and hear the constant drone of an engine. A jolt, and the smooth ride becomes rough. A jagged pinging noise sounds from below as the swaying motion of turns becomes more frequent, near constant. We must be close to wherever we’re heading. As I think it, the car halts. So does my heart. Listening intently for any sign of my impending demise, my senses seem to sharpen. There’s a muffled thud that sounds like a door. Silence. Waiting. Everything is dreadfully quiet. I can actually hear the stillness. Even my thoughts are a whisper, barely intelligible over the buzz in my ears. 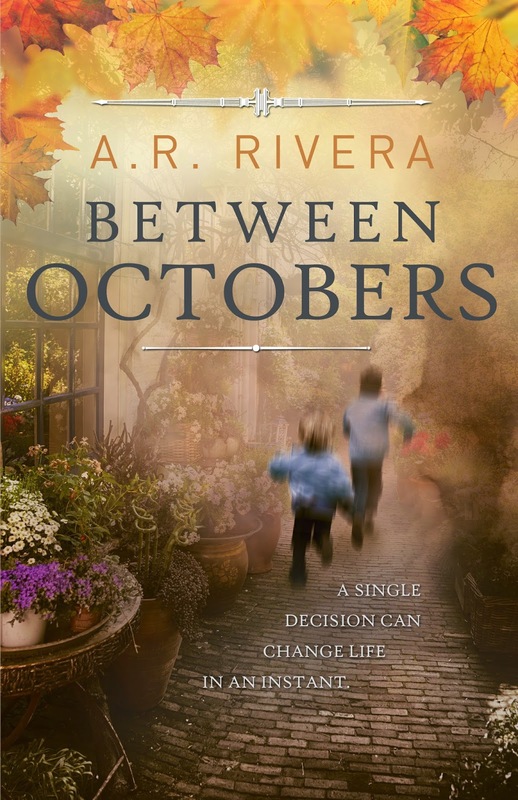 Between Octobers is the newest novel from Take Two Publishing and the debut novel for author A.R. Rivera. A single decision can change life in an instant.